Deputy Manager (Dairying) - 2 Posts (1 BC-DW ; 1 MBC-DW) - Basic Pay 9300 Grade Pay 4400 in Pay Band II - Degree with IDD / NDD or Master's Degree in Dairy Science / Dairying / BTech Food Technology / Dairy Technology / Food Processing - Age : no age limit. 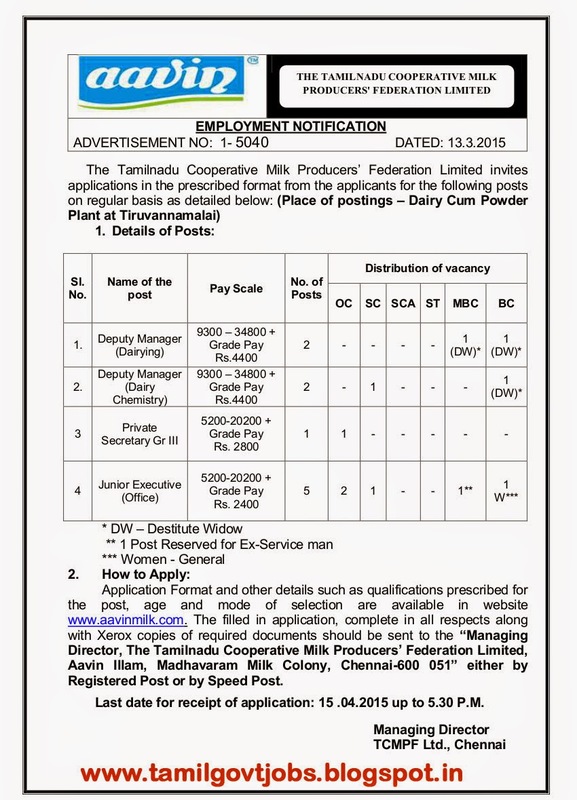 Deputy Manager (Dairy Chemistry) - 2 Posts (1 SC ; 1 BC-DW) - Basic Pay 9300 Grade Pay 4400 in Pay Band II - Master's Degree in Dairy Science / Dairy Chemistry / Chemistry / Biochemistry / Quality Control Management - Age : no age limit. Private Secretary Grade III - 1 Post (UR) - Basic Pay 5200 Grade Pay 2800 in Pay Band I - any Bachelor's Degree with Typewriting English Senior Grade, Typewriting Tamil Junior Grade, Shorthand English Senior Grade, Shorthand Tamil Junior Grade with computer skills - Age 30 years. Junior Executive (Office) - 5 Posts (2 UR ; 1 BC-W ; 1 MBC-Exserviceman ; 1 SC) - Basic Pay 5200 Grade Pay 2400 in Pay Band I - any Bachelor's Degree course and Diploma in Co-operative Management - Age 30 for UR ; No Age limit for all others - Posting in Chennai. Separate application should be send for each post.Selection by written test and interview. Posting at Thiruvannamalai District Tamilnadu.